It's All about Direction! 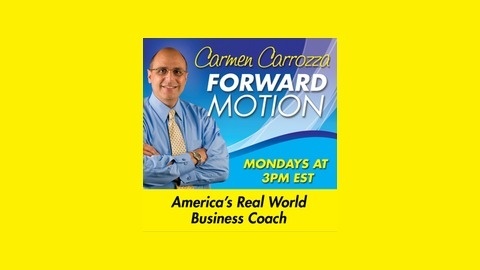 Forward Motion enriches your journey towards extraordinary success Is it possible to be entertained while talking about the most important issues that affect your business and your life in the complex world we live in? 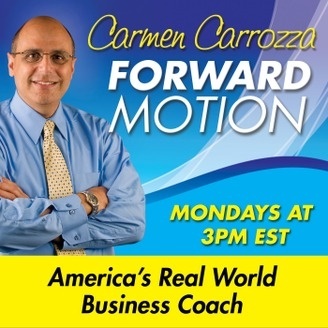 Tune in to Forward Motion with Business and Life Coach Carmen Carrozza to discover solutions that can clearly support positive change in any phase of your life, or stages in your business! Resolution strategy for ANY time of year! 80% of the population sets a New Year's resolution or three, usually holding it internally. Only about 8% actually see them through for at least 6 months! Why are we so bad at setting goals and working to achieve them, for our own good? Find out why and how you can rise above and reach new levels of success you never thought could happen! Carmen sounds off! Leadership in a very different world. We'll show you how to get it right, right now! Our end of year money and business report! HSBC head of Middle Market Corporate Banking Derrick Ragland on the export-import business! Are you the leader you want to be for 2015? Brian Brandt is here to help you get there fast!